Project Rewards: Before I launch into this review, I wanted to make sure everyone knew about the awesome new items in our Project Rewards center. Check it out for a chance to win stuff like a Bosch 12v drill/driver, a Ridgid pneumatic JobMax, a Kwikset handle set, a Martha Stewart paint set and more! All you have to do is register for a free account to start earning Project Points that you can use to bid on these sweet prizes. Check out how it works here. Indeed, most of the specifications are very similar. 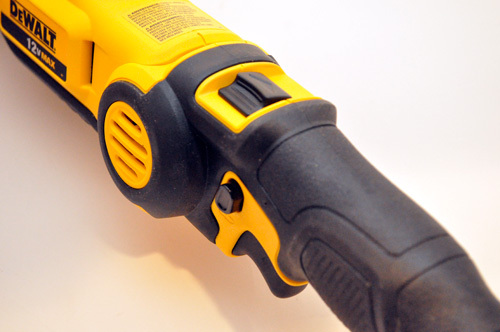 The DeWalt offers a 0-2,700 strokes per minute (SPM) with a stroke length of 9/16″. 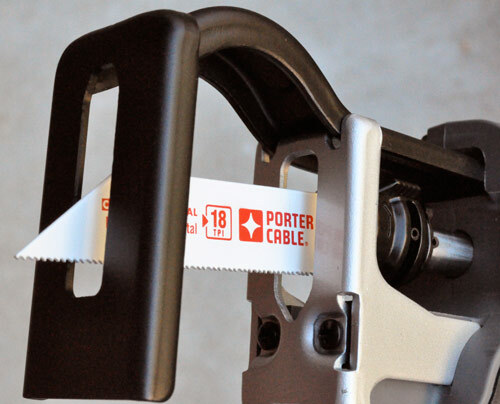 Compare that with Porter Cable’s 0-3,000 spm and 5/8″ stroke length. Both feature a 3-position pivoting handle, safety lock, variable speed trigger, bla bla bla. 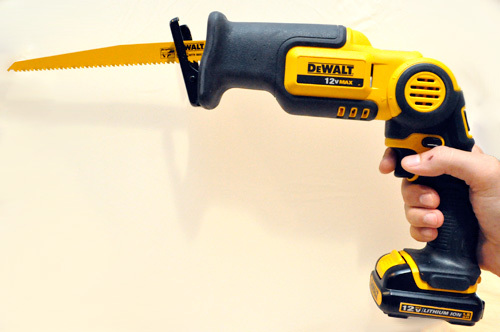 Despite all that, I like the DeWalt saw better, and here’s why. 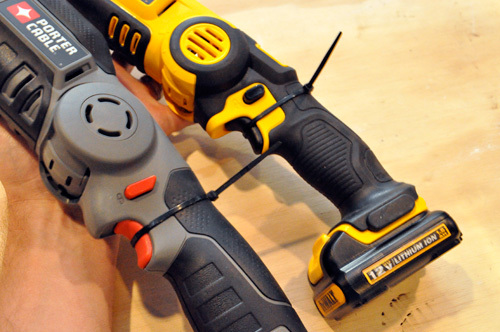 In a head-to-head runtime challenge, the DeWalt Pivoting Reciprocating Saw outperformed the Porter Cable Clamp Saw by almost 25%! Using zip-ties and fresh batteries, I ran both saws until they quit. The DeWalt saw ran for 22:01 min. and the Porter Cable ran for 16:46 min. That’s important to me when I’ve wedged myself in an attic trying to cut ridiculously large 6″ PVC for my dust management system. These results make even more sense when you compare the batteries. 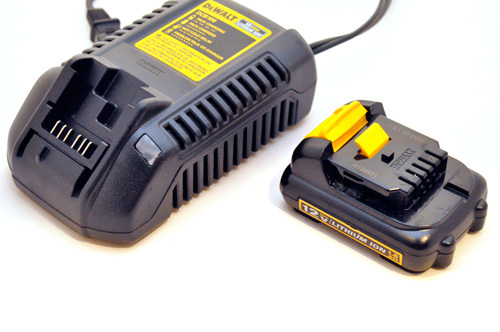 Even though both saws work off the 12v platform, DeWalt provides a 1.5 amp hour (Ah) battery while PC provides a 1.3Ah battery. I still can’t understand why PC refuses to upgrade their batteries when it’s obvious that they are sacrificing performance. In the power tool world, size, weight and runtime are usually the deciding factors, and for me, runtime is king. Bring on the brushless motors and the 4.0 Ah batteries because I hate going back to the charger. Just had to comment on the Rewards Center. Such great prizes you’re giving away! Thanks! Being that they are from the same parent company, why do you think the PC line still has the 1.3 Ah batteries? Quick comment on the Ridgid JobMax pneumatic in the rewards center. It’s recommended to use 18.2 CFM @ 90 psi. That’s large stationary compressor territory. I’d noticed that too about the Air JobMax. I think you still get moderate performance on a portable compressor, just not the full effect. Have you heard that? You’ll still get the same performance, just for less time between cycling the compressor. If it takes 90 psi to run the tool properly, then you’re going to consume about 18 CFM. It will consume that same volume of air at that pressure no matter what compressor you have. The problem is that smaller compressors come with smaller tanks, and are not designed to cycle constantly. At that consumption, you’ll consume a 21 or 26 gallon tank down below the 90 psi threshold in no time. This will in turn kick on the compressor. If you keep using the tool during that run time, you’ll either have less than optimal performance (because of low air pressure), or you’ll just be consuming most of the air the compressor puts out, or both. It creates LONGER run times on the compressor, as well as more frequent ones. This is significant wear and tear on a smaller, portable single-stage compressor. A permanent, two-stage compressor will fill far faster, be designed to handle more wear and tear, and probably see less of it anyways because of the larger tank. A 60 gallon stationary model would be where I’d aim. I’m using a 21 gallon tank on a compressor that delivers far less than 18.2 CFM, so I’m glad Jeff pointed the consumption out. I’d still use the tool on my setup, just not for large projects. Trimming something, some small sanding, that sort of thing. You wouldn’t go at removing all the grout from your entire bathroom or sanding an entire piece of large furniture. I just got this tool yesterday and was trying it out on a couple different jobsite compressors. One being the 6 gallon bostitch with 2.3 cfm @ 90 and then the Ridgid Tri-Stack 5 gallon with 4.9 cfm @ 90. It was effective on both compressors but the bostitch cycled a lot more often (obviously). The tri-stack did a great job with it sustaining it at 90 psi for almost 30 seconds. Granted this was measured by watching the gauge and using a stopwatch. I didn’t feel like cracking out the calculus to figure out exactly when it dropped below the 90 psi threshold. Who ever picks this up in the rewards center (auction ends tonight) will be pleased with it as long as they have a good size pancake compressor (or larger). The tool vibrates a heck of a lot less than my 12v Craftsman. This is precisely why I signed up originally I get the most value from tool reviews. It provides either assurance over decisions already made or guidance into new ones. 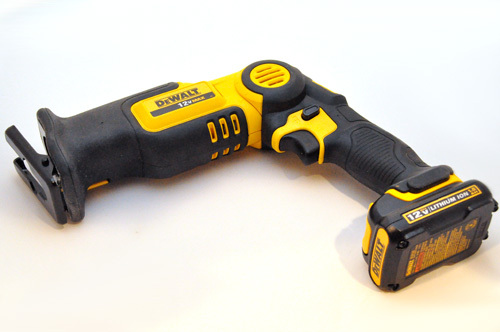 As previously stated I’m looking to upgrade my Ryobi 18v line eventually to DeWalt but in the meantime I’ve looked at getting into the DeWalt 12v mainly for the better quality in the inspection equipment such as the infrared thermometer and inspection camera. This flexing recip saw caught my eye and while I liked the look of the single hand operation of the Rigid Fuego corded recip saw I really like to get to as few of brands as possible due to warranty followup and battery interoperability as possible. You are making me want to go out and get the whole Dewalt 12v line-up! size, weight, and runtime are probably really important to contractors, but another thing that makes a big difference to me is whether or not it can use the same batteries I’ve already got for other tools. The last thing I want is to need a dozen battery chargers plugged in somewhere, each charging batteries for different tools. Product performance aside, If I’ve already got a set of batteries that fits one or the other, it’s going to greatly influence my decision. That’s a great point Reuben, and I think contractors are in the same boat. It’s that exact reason that keeps so many of them on older 18v NiCad lines rather than newer (and better) Li-ion. Switching to a new battery would mean calling “bankruptcy” on 5+ tools, and that’s a big investment. I’m not sure how the PC saw changes blades, but I’m a big fan of the way the DeWalt recips do blade changes. 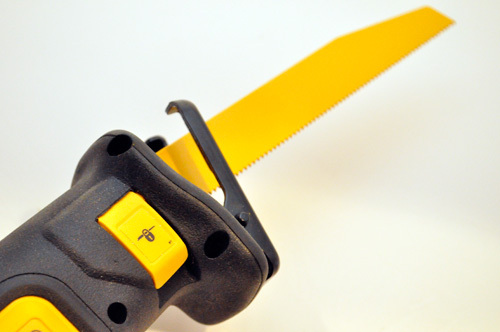 We use them at work, and in the middle of an extrication is the last place you want to be fiddling with difficult methods of changing a worn or broken blade with gloves on. PC has a tool-less blade change too. All you have to do is rotate the collar and the blade comes free. It’ll be a little tough with gloves on though. Although I agree that runtime is the deciding factor for a power tool, what (if any) is the weight difference? Not ever too big a concern for me, but it would be interesting to note whether or not the PC sacrificed some performance for weight concerns. Great review! PC lists the weight at 3.4lbs (with battery) and DeWalt lists 3.1lbs (probably without the battery). So very comparable. 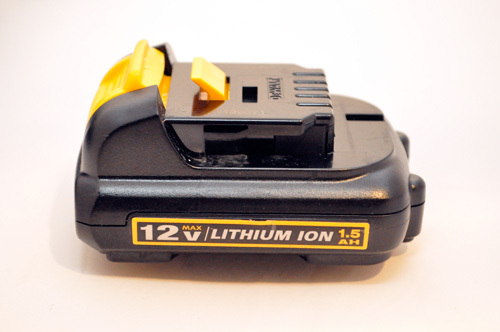 How does the Ryobi 18V Lithium Ion recip. 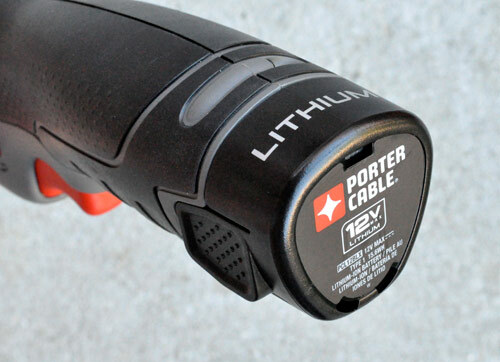 saw compare to the 12V DeWalt or Porter Cable. I’m thinking about getting one, with primary use to cut branches.